one of six major tributaries that flow to NW Arkansas’ primary drinking water source. Although relatively minor, this small stream has an impact on downstream sediment and nutrient loads. 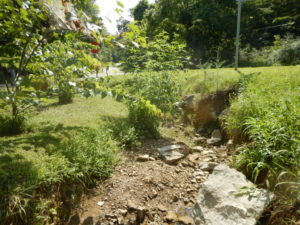 Stabilization of this site will reduce contaminants entering the waterway, enhance aquatic and terrestrial habitat, and improve the aesthetics of the park. 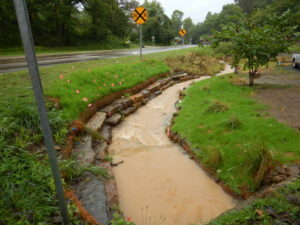 The creek runs approximately 260 feet along a portion of Highway 74. Most, if not all, of the stream corridor falls within the Arkansas Highway and Transportation Department (AHTD) Rightof-Way for Highway 74. AHTD had to be contacted and provide approval before undertaking any action shown in this plan. The reach runs between a culvert under Peek Ave. (upstream) and out through two culverts under Highway 74 (downstream). At the downstream end of the reach, a drainage pipe from the southeast empties into the creek. The contributing watershed area to the reach is 0.15 mi2.